Undersea infrastructure refers to equipment and technology placed on or anchored to the ocean floor. This infrastructure includes cables for telecommunication, cables for power transmission, and other stationary equipment for scientific research. The submarine cable industry has been installing infrastructure on the seafloor since 1851, when the first submarine telegraph line was laid between England and France. There are two main types of cables: those that facilitate telecommunication and those that transmit energy. Submarine telecommunication cables transmit 97 to 99 percent of international communication from the United States (Wargo and Wall 2014). In the future, development of offshore wind energy facilities will require connection to shore through one or more cables per facility, depending on the size and location. Interconnection by cables between the individual wind turbines and one or more electrical service platforms will also occur within the footprint of the wind facility (BOEM). Today, most cables are buried 3 to 6 feet below the seafloor (Wargo and Wall 2014). 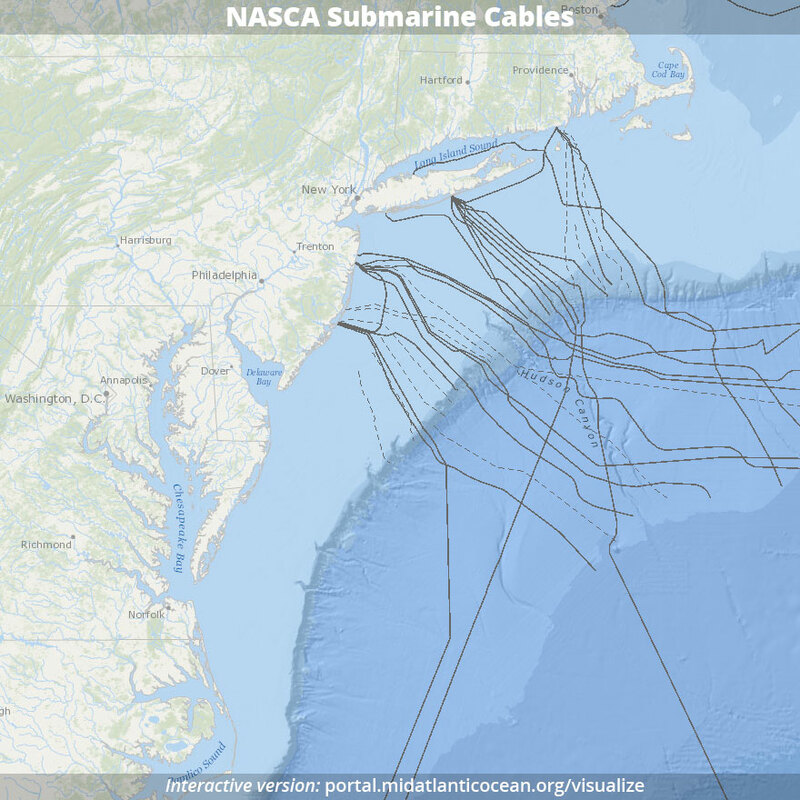 Maps of submarine cables owned by members of the North American Submarine Cable Association (NASCA) can be viewed on the Mid-Atlantic Ocean Data Portal; the data are not downloadable for industry privacy reasons. As cables are taken out of service, they are generally not removed. More recently, states are including provisions for cable removal in installation and/or lease contracts. Some companies are setting up recovery and recycling processes, and new permits sometimes require that the company does not cause more environmental damage than benefit when recovering a cable. NASCA submarine cables. For interactive map, go to MARCO Data Portal and click on Maritime > NASCA Submarine Cables. Many important pieces of scientific equipment are deployed on or are anchored to the seafloor in the Mid-Atlantic. This infrastructure provides important information about real-time atmospheric and oceanographic conditions at sea and along the coast, such as tides, air temperature, water temperature, wave height, and wind speed. Equipment is deployed and maintained by various federal agencies and state agencies, and academic institutions. 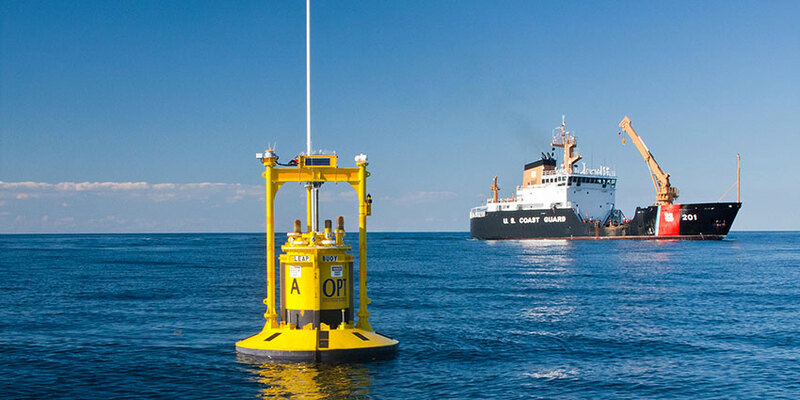 For example, the NOAA National Data Buoy Center, operated by the National Weather Service, has more than 20 buoys and coastal stations in the Mid-Atlantic region. Instruments deployed for long periods of time can be used to track changing conditions and aid in the study of climate change, natural environmental variability, and impacts from other human activities. Some of the data collected by at-sea equipment can be viewed and downloaded online through the Mid-Atlantic Regional Association Coastal Ocean Observing System (MARACOOS).